This cartoon presents the supposed dilemma that Senator Charles Sumner, a long-time advocate of civil liberties and civil rights, particularly for black Americans, faced in deciding whether to endorse Horace Greeley for president. 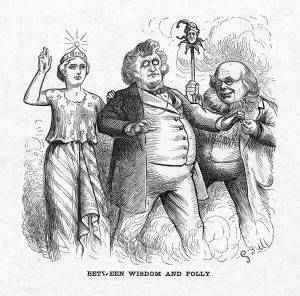 The senator stands between Lady Liberty ("Wisdom") and Greeley ("Folly), who holds a jester's stick. Sumner opposed President Grant's foreign policy and supported most of the Liberal Republican policies, but was suspicious of their alignment with the Democrats. After studiously ignoring the Liberal Republican movement, he finally wrote on July 29 a public letter to black voters, asking them to back the Greeley ticket. In failing health, the senator then left the country for a vacation in Europe.